We are committed to treating all children with compassion and respect as we feel it is a privilege to treat the dental needs of children. We strive to have a positive impact in the lives of our patients and their families. Our team will provide specialized and comprehensive care for infants, children and adolescents in a friendly, fun and state-of-the-art environment. We encourage parental participation in regard to their child’s dental health and will stress education and prevention. Please understand we schedule all new patients and children under age six in the morning, as we try to reserve afternoon appointments for established, school-aged children. We reserve a specific time just for you in order to allow the best possible care for your child. We will make every effort to be on time for your child's appointment and ask that you arrive promptly at your scheduled time. Occasionally, an emergency may occur which may cause a slight delay. New patients and children under age 6 are scheduled in the morning. We try to reserve afternoon appointments for established, school-aged children. 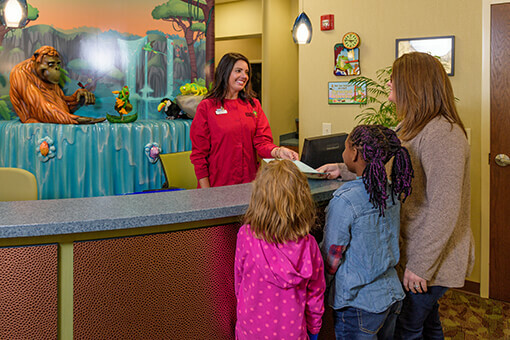 No charge will be made for rescheduling your appointment, provided 24 hour notice is given so that your child's time can be given to another patient. If an appointment is missed without prior notification, our office reserves the right to charge a missed appointment fee. Parents are invited back during the initial exam. This allows Dr. Stephanie and Dr. Krissy to meet you and also discuss her findings and any treatment that may be necessary. For future check- ups and during treatment appointments, we do encourage parents to allow their child to come back alone. This is meant to establish trust in our team and confidence in your child. If for any reason your child asks for you or needs your, please know you would be escorted to the treatment area promptly. During a treatment appointment, if elected, one parent is allowed to accompany their child. We ask that you remain a "silent observer" so that Dr. Stephanie, Dr. Krissy and their team are able to effectively communicate with your child. Research has shown that children over the age of 3 tend to behave better when the parent is not present. As your child matures, we hope they will feel comfortable coming back by themselves. This helps to better establish your child's trust and independence. During sedation appointments, we do NOT allow parents in the treatment area for several reasons, which would be discussed with you in detail if recommended for your child. Finally, if you expect your child to do well and enjoy their visit, chances are they will do just that! Payment is due at each visit for services rendered. We accept cash, Debit Card, VISA, Discover and MasterCard. We no longer accept personal checks. For our patients with dental insurance, we are happy to submit your claims and file to most dental insurance companies. Our office is out of network with all insurance companies; this means you are responsible for any portion that your insurance does not cover. Please be familiar with your insurance benefits so that you may receive the maximum benefit. We ask that you pay for the non-covered portion at the time of service. Payment is due at each visit for services rendered. We accept cash, Debit Card, VISA and MasterCard. We no longer accept personal checks. For our patients with dental insurance, we are happy to submit your claims and file to most dental insurance companies. Our office is out of network with all insurance companies; this means you are responsible for any portion that your insurance does not cover. Please be familiar with your insurance benefits so that you may receive the maximum benefit. We ask that you pay for the non-covered portion at the time of service. PLEASE UNDERSTAND that we file dental insurance as a courtesy to our patients. We do not have a contract with your insurance company, only you do. We are not responsible for how your insurance company handles its claims or for what benefits they pay on a claim. We can only assist you in estimating your portion of the cost of treatment; we at no time guarantee what your insurance will or will not do with each claim. We also cannot be responsible for any errors in filing your insurance; once again we file claims as a courtesy to you. In the event that your insurance has not paid on a claim within 30 days of the date of service, we reserve the right to directly bill the responsible party. There are some insurance companies that will only pay to YOU as the subscriber. If this is the case with your insurance, we do expect that you pay for services in full. We will still file the claim for you as a courtesy, and you can expect a check from the insurance company to be sent to you within a few weeks. Our practice grows through referrals from our patients. We sincerely appreciate your recommendation of our office to your friends and neighbors. We thank you for your trust.